To enable members to be more effective and efficient in attracting visitors to their communities. The Council provides educational opportunities in order to raise the level of professionalism in the travel industry, and it provides a forum for networking and cooperative action between the members. 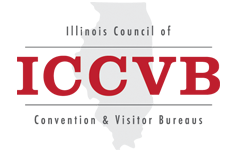 Illinois' CVBs will effectively generate economic wealth for their communities, while valuing ICCVB as an indispensable industry resource and the recognized voice of destination marketing in Illinois.